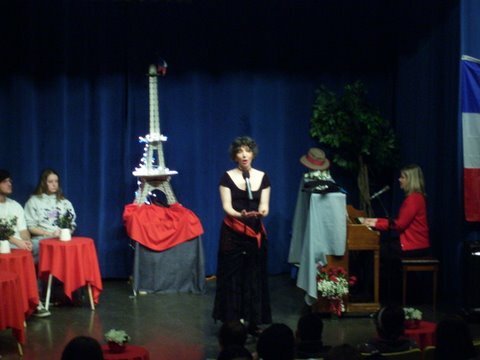 Leading teachers of French talk about Claudia's "Cabaret in the Classroom." A cozy cabaret. At the tables, scattered "Bonjour's" and "S'il vous plait's." By the piano, la chanteuse Marcelle draws her young audience into the latest hit by Edith Piaf or a tune by one of the Americans who's right at home in Paris like Cole Porter or Duke Ellington. Is this really Paris in 1950? No, it's a 21st century American classroom transformed by Paris-born Claudia Hommel to give students a new, captivating perspective on France, on history, and on human relations. In school assembly, workshop, master class, or field trip, Claudia's presentations provoke young people to cross borders of country, time, culture, and musical genre. From classroom to French restaurant, Claudia Hommel has a program to fit your curricular needs. Flexibly designed, each cabaret performance runs from 40 to 90 minutes and is available for groups of 30 to 300 students at an affordable cost. All programs vary the amount of French appropriate to the student level from elementary school through college. Each program has a study guide and suggestions for teachers and students.